When is the 2019 Ride? The CT Challenge is a two-day experience. The Opening Ceremony/Friday BBQ Bash is on Friday, July 26th. The 10-, 25-, 50-, 75- and 100-mile rides are on Saturday, July 27th. Saturday, July 27: All Saturday distances (10, 25, 50, 75 and 100-mile rides). I want to ride. Are there fundraising requirements? *Fundraising commitments for students are the same as adult commitments. However, teams/families of four or more members may share funds by having their team captain contact us at info@ctchallenge.org by October 11, 2019, one week prior to the fundraising deadline. If a rider has not raised his/her minimum amount by October 18, 2019, the balance of the minimum will automatically be charged to the credit card provided at registration. No. You are charged only your registration fee when you register. You have until October 18, 2019 to raise your required fundraising minimum. After that date, any balance remaining will be automatically charged to the credit card that you provide at registration. What is my personal fundraising page? How do I find it? When you register for the ride, you automatically receive a personal fundraising page. You will see generic pictures and text appear. We encourage you to share your story–why you are riding and/or for whom–in your own words with your photos and/or videos. When you reach out to friends and family for donations, you direct them to your page by attaching a link to an email where they can make a donation. People who personalize their fundraising page typically raise 2x or more than people who do not. You access your page by clicking on “Login” in the top right of http://bike.ctchallenge.org and using the username and password you established during registration. I’ve registered, but can’t figure out how to edit my profile. To edit your profile (e.g., to change your username or password, email, phone #, etc. ), sign on by clicking on “Login” in the top right corner of http://bike.ctchallenge.org. Enter the username and password you established when you registered. This will take you to your personal fundraising page. Next, click on the “Fundraising” tab on the left side of your screen. You can edit your profile through this link. If you have any problems, contact us at info@ctchallenge.org. How do I change my personal information or my username and password? You cannot change your username. You can change your password and update your personal information by logging on to your personal fundraising page. (Log in by clicking on “Login” in the top right corner of http://bike.ctchallenge.org.) Next, click “Profile” which you will see on the left side of your screen. Three links will appear beneath “Profile.” Click the desired action. I want to ride but I am not sure I can raise the required minimum. What should I do? Experience has shown that riders who put a good effort into their fundraising can raise their minimum easily. Rarely, if ever, has a rider made a serious attempt to meet the fundraising minimum and failed. In fact, most riders exceed their minimum by a meaningful margin. Take advantage of the fundraising toolkit on the website. Most importantly, start early and don’t be shy about asking for money. You are supporting game changing programs and services for cancer survivors, a very noble cause. Do not register to ride unless you are committed to raising the money. Take that commitment seriously. Need more help? Send us an email at info@ctchallenge.org. Please be specific about what’s tripping you up so we can give you the best advice. I’m having trouble uploading my picture. What is wrong? Your picture must be either a JPG or PNG format. The website should automatically resize your photo if it is too large. If you still have questions, you can email info@ctchallenge.org. Log on to your personal fundraising page by clicking on “Login” in the top right corner of http://bike.ctchallenge.org. Next, click on “Fundraising” on the left side of your screen. Three links will appear beneath “Fundraising.” Click on “Manage Sponsors.” You will see “Fundraising Goal” in the table that appears in the middle of your screen. Click on the “change” link to the right of your current goal. Remember that your fundraising goal cannot be set lower than the minimum required for the ride distance you selected. Am I obligated to raise the amount I set as my Fundraising Goal? No. The Fundraising Goal is your target, not an obligation. Set it high to motivate you and your donors, but you are obligated to raise only the required minimum for the distance you registered to ride. You may raise or lower your goal anytime you wish, though you may not set it lower than your required minimum. Most riders exceed their fundraising minimums. The average rider in 2018 raised more than $1,000. You can do it too! If I register to ride one distance, can I later change my mind and ride a different distance? You can decrease your ride distance at any time before the start of the ride on July 27th. If you make the change prior to July 27th, you must email info@ctchallenge.org. The change will not be considered complete until you receive an email reply from CT Challenge. You will then be responsible for the fundraising commitment associated with the new ride distance by the October 18, 2019 fundraising deadline. We encourage all riders to join or create a team. Teams enjoy training and fundraising together, have more fun on the day of the ride and raise more money. A “Team” is four or more riders. Can I form a team or join a team later, after I’ve registered to ride as an individual? Yes. Contact the CT Challenge at info@ctchallenge.org. Virtual Riders are individuals who choose to participate in CT Challenge by only fundraising. Some virtual riders are away the day of the ride. Some choose to ride or spin on their own at a later date. Others are not cyclists or physically able to ride a bike. There are no fundraising minimums for Virtual Riders. However, you must pay a non-refundable registration fee of $10 to register as a Virtual Rider. Because Virtual Riders need not meet a fundraising minimum, CT Challenge does not retain your credit card information. Most Virtual Riders are able to raise a significant amount of money and share the great satisfaction of being part of this triumphant event even when they can’t be there or participate as they may want. How much is the registration fee for riders? Road Warriors pay the registration fee associated with the distance they choose. Important note: Teams/families of four or more members may share funds by having their team captain contact us at info@ctchallenge.org by October 11th, one week before the fundraising deadline. For example, if all 4 team members sign up for the 25 mile route ($500 minimum), each person will need to fundraise the minimum of $500 and the team must raise a total of $2,000. If one of your team members raises $400 and you raise $600, you can share your $100 to the other rider. Each teammate must average $500 in this example. No. Rider registration fees do not apply towards fundraising minimums. Registration fees help defray ride operating expenses. Every Rider pays a registration fee that does not count toward his or her minimum fundraising commitment. This is charged to your card when you register. If you do not reach your fundraising minimum by the October 18, 2019 fundraising deadline, your card will be charged for the remainder, if any, of your commitment. Riders, Virtual Riders and Volunteers have until October 18, 2019 to raise funds for CT Challenge 2019. After this date, Riders with a required fundraising minimum will be charged for the remainder, if any, of their commitment. What happens if I don’t reach my required fundraising minimum? If you don’t reach your fundraising minimum by the deadline of October 18, 2018, the balance will automatically be charged to the credit card you provided at registration if you are a rider with a minimum fundraising commitment. What is a Road Warrior? Anyone who has maintained at least $3,000 in his/her fundraising account as of the October 18, 2019 fundraising deadline is a Road Warrior. Road Warriors receive special recognition for their incredible accomplishment. To register to ride as a Road Warrior, click here. How do I get the 2019 Cycling Jersey? This year, all who want one may obtain a 2019 CT Challenge Cycling Jersey by purchasing one from the CT Challenge store: https://ct-challenge.myshopify.com. How do I get copies of photos taken at the event? Photos taken by CT Challenge photographers at the 2019 Ride may be downloaded through our Flikr albums. You may access these photos by clicking here. Photos from previous years are posted for viewing and purchase at www.backprint.com/ctchallenge. We hope you don’t but you can cancel your participation as a rider in CT Challenge. Here is our 2019 Cancellation Policy. If you want to cancel your registration, you MUST send an email to info@ctchallenge.org requesting a cancellation and you MUST receive a confirmation email from the CT Challenge acknowledging that your cancellation has been processed. This cancellation policy applies to all distances. Cancel prior to June 30, 2019 and you are released from the balance of your fundraising commitment. Cancel at any time for any reason and you forfeit your registration fee. If you cancel after June 30, 2019, in addition to forfeiting your registration fee, you are responsible for fulfilling your fundraising commitment. Any remaining balance of a fundraising commitment on October 18, 2019 will be charged to the credit card used at the time of registration. No donations will be refunded. Participants wishing to cancel their registration MUST send an email to info@ctchallenge.org requesting a cancellation and MUST receive a confirmation email from the CT Challenge that the cancellation has been processed. The cancellation is not valid until that confirmation email has been received. You can make a donation by credit card or check by visiting the rider(s) or team page of the individual(s) you want to support. You may also make a general donation by clicking here: Donate. When you make your donation, you will also see that you can opt to cover the credit card and vendor processing fees to maximize the amount of support we are able to capture for the mission. How do I make a donation by check? If you would like to make a donation by check, please print, complete and include a Donor Form. Please make the check payable to “CT Challenge” and mail it to CT Challenge, P.O. Box 566, Southport, CT 06890. Be sure to include the name or team to which you are donating in the memo line of the check as well, particularly if you cannot access the donor form. Please note the above address accepts USPS mail only. All donors who provide their email address will receive a donation receipt via email that can be used for tax purposes. The CT Challenge does not share its email list with outside organizations. All donors who contribute $250 or more by check will receive a written acknowledgement of the donation from the CT Challenge by year end. This can act as a receipt for tax purposes. Donors who give an amount by check that is less than $250 should keep their canceled check as their receipt. Can I go back and change the amount of my donation? No. You cannot change the amount of a previous donation. You can make another, separate donation. I made a donation to the wrong rider. Can I change it? Contact us at info@ctchallenge.org and we can direct your donation to the correct rider. Can I make a donation to my own ride? Yes. When you register, you can make an initial donation to your ride to jump-start your fundraising efforts. You can also make additional donations to your ride at later dates by simply visiting your own fundraising page. How can I see how much a rider has raised to date? Click on “Find a Rider” which you will see at the top right of your screen at bike.ctchallenge.org. Follow the prompts to find the rider in which you are interested. Click on their name to go to their donation page. Their current fundraising results will be displayed there. Can I make a donation in honor or memory of someone and have it recognized on the website? Yes. Before you submit your donation for processing you will have the option to dedicate your donation In Memory, In Honor or In Support of someone. Can I change the dedication for my donation? You cannot change your dedication after you have submitted your donation for processing. Contact us at info@ctchallenge.org and we will change your dedication for you. Please include the following information: Rider name, donor name, date of donation and desired dedication name. Why do you ask for so much donor information? The data we collect is necessary to create accurate donor records and provide appropriate tax acknowledgement information. If you have any questions about the information that is being collected, please contact CT Challenge at info@ctchallenge.org. How does CT Challenge handle tax acknowledgement receipts for cash donations? If you would like a tax acknowledgment receipt, it is always best to make your donation by credit card or check. CT Challenge can issue tax acknowledgement receipts for cash donations only if they are brought directly to the CT Challenge office by the actual donor. Please do not send cash through the mail. If you are a Rider who has received a cash donation, there are two options for applying the cash donation to your ride: 1) Keep the cash and make an online credit card donation to yourself for the same amount. Please note, however, that if you use this option, you will become the official donor and you will receive a tax acknowledgement receipt at the email address that you provide. Please do not substitute the cash donor’s name or address for your own when you make the credit card donation on your card. 2) You may bring the cash donation to our office. In this scenario, CT Challenge cannot issue a tax acknowledgement receipt to the cash donor who is not present, but you can pick up a blank cash donation receipt that you can provide to your donor to fill out for his/her own record keeping. Please note, CT Challenge will not complete this receipt form for you as it must be completed by the donor. Can I change how my donation or name shows up in the Honor Roll? Can I have my name and donation amount removed from the Honor Roll altogether? Yes to both questions. Please contact the CT Challenge at info@ctchallenge.org with your desired change. All donations are 100% tax deductible in the United States. For foreign donors, please refer to your local tax laws to determine if your donation to CT Challenge is tax deductible. All donors who provide their email address will receive a donation receipt via email that can be used for tax purposes. The CT Challenge does not share its email list with outside organizations. All donors who contribute $250 or more by check will receive a written acknowledgement of the donation from the CT Challenge by year end.This can act as a receipt for tax purposes. Donors who give less than $250 by check should keep their canceled check as their receipt. Is CT Challenge a 501(c)(3)? Does CT Challenge accept matching gift donations and if so, how do I apply? Yes, CT Challenge accepts matching gifts. In order to apply for a matching gift, you will need to follow the process required by the individual company to which you are applying for the matching gift. Usually, you will be required to start the process using an online portal or paper forms that can be obtained from your HR or charitable giving office. Send completed matching gift forms to CT Challenge, 250 Pequot Ave., Southport, CT 06890 or email them to info@ctchallenge.org. To check whether or not your company participates in a matching gift program, click here. What is a Matching Gift Donation? Many companies will match donations made by their employees to qualifying organizations. After making your donation online or by check, you should mail or e-mail your company’s matching gift form to CT Challenge. We will take care of the rest. When the matching gift check arrives, the amount will be credited to the Rider you designated for your original donation. Matching gift programs are a simple way for donors to double the impact of their donation. You can view more information on the Matching Gifts page of our website under the “Donate” tab. Visit Matching Gifts to determine if your company has a matching gift program. How long will it take for a matching gift to be processed? CT Challenge processes all matching gift requests as soon as they are received. Companies issue matching gift checks to CT Challenge on varying schedules so it may take weeks or even months for a matching gift to show up in a rider’s fundraising account. How do I identify CT Challenge as the entity to which a matching gift should be sent? Can I make a stock donation? Yes. Click here for all the information you will need to make a stock donation to CT Challenge. No portion of a rider’s registration fee counts toward the fundraising minimum. Registration fees help defray event operating expenses. Riders may make a voluntary contribution to their ride at the time of registration or at any other time. This would count toward their fundraising minimum. CT Challenge provides many great tools to help you reach and surpass your minimum fundraising commitment. When you register, you automatically receive your own fundraising webpage, which you can customize with pictures and your message about why you are riding. Riders who personalize their fundraising webpage raise significantly more than those who do not. Click here for our fundraising toolkit. How can people make an online donation to my ride? When you register, you automatically receive a personal fundraising web page on the CT Challenge website. You can give people a link directly to your personal page where they can read about your ride and make a secure donation with a credit card. People can also get to your personal fundraising page by visiting and clicking on Rider Search. You may also include links to your fundraising page through your Facebook page and other social media platforms you use. What is the minimum fundraising commitment? *Fundraising commitments for students are the same as adult commitments. However, teams/families of four or more members may share funds by having their team captain contact us at info@ctchallenge.org by October 11, 2019. Riders, Virtual Riders, and Volunteers have until October 18, 2019 to raise funds for CT Challenge 2019. If you don’t reach your fundraising minimum by the October 18, 2019 deadline, the balance will automatically be charged to the credit card you provided at registration. Can I use CT Challenge marketing materials for my personal fundraising efforts? Yes, you are able to use CT Challenge logos for your personal fundraising efforts. Please send any final designs that use CT Challenge assets to info@ctchallenge.org for approval before publication or production. Please click here to access the CT Challenge fundraising toolkit. How do I find who donated to me in previous years? If you would like a list of your donors from prior years and do not see a way to access this information in your fundraising dashboard, please contact info@ctchallenge.org and we will send it to you. What do I do if a donor hands me a check? Please mail the check to CT Challenge, P.O. Box 566, Southport, CT 06890. Please print, complete and include a Donor Form. If they did not give you a Donor Form, please include your name and team name (if applicable). If the donor made the check out to your name, you are able to sign the check over to CT Challenge prior to mailing it in by endorsing the check and writing “Pay to the order of CT Challenge” beneath your signature in the endorsement area on the back of the check. What happens to donations made after the October 18, 2019 deadline? They are credited to the rider’s account and count toward their fundraising goal. Yes, CT Challenge accepts matching gifts. In order to apply for a matching gift, you will need to follow the process required by the individual company to which you are applying for the matching gift. Usually, you will be required to start the process using an online portal or paper forms that can be obtained from your HR or charitable giving office. Send completed matching gift forms to CT Challenge, 250 Pequot Ave. Southport, CT 06890 or email them to info@ctchallenge.org. To check whether or not your company participates in a matching gift program, click here. Many companies will match donations made by their employees to qualifying organizations. After making your donation online or by check, you should mail or e-mail your company’s matching gift form to CT Challenge. We will take care of the rest. When the matching gift check arrives, the amount will be credited to the Rider you designated for your original donation. Matching gift programs are a simple way for donors to double the impact of their donation. You can view more information on the matching gifts. page of our website under the “Donate” tab. What if CT Challenge does not receive a matching gift on my behalf before the fundraising deadline? The CT Challenge tracks matching gifts closely and takes them into account when reviewing rider fundraising results. If we know that there are outstanding matching gifts in a rider’s name, those amounts will be taken into consideration before credit cards are charged. Teams/families of four or more members may share funds by having their team captain contact us at info@ctchallenge.org by October 11, 2019, one week prior to the fundraising deadline. Each team selects a team captain who will create the team. The team can be created when the captain registers or at any later time on the captain’s personal web page. Team members should each register individually as a part of their team. Team members do not have to ride the same distance. How do registration fees work for team members? Each team member must register as an individual and pay the registration fee that matches the distance he/she is riding. There is no other registration fee for teams. How are donations credited to individual team members and the team? All money raised by team members, including matching gifts, is credited to their personal accounts and, automatically, to the overall team account. How do fundraising minimums work for team members? Each team member is responsible for raising his/her own required fundraising minimum. However, teams of four or more may share funds (see above). How far do we have to ride at once? There will be a rest stop every 12 to 15 miles for water, food, mechanical and medical attention. Support vehicles will also patrol the route to provide assistance, if necessary. Please visit the Course Maps page for detailed route information. Any changes to the routes will be updated there. Which route should I select? We encourage you to register for a route that you are physically comfortable riding. Please visit the Training Tips page on our site. Will you be hosting any group rides to prepare for the event? Yes. When the weather turns warm enough for outdoor riding, we’ll be planning training rides to depart from locations such as the Center for Survivorship in Southport or Zanes Bike Shop in Fairfield. During the colder months, CT Challenge cyclists are welcome to ride indoors at the Center during Saturday morning classes. A small drop-in fee of $10 is requested. For a complete list of events, including training rides, check the “Calendar of Events” page in the Community Section of bike.ctchallenge.org. What can I expect on the ride? We’ve selected very scenic routes, keeping in mind that riders of all levels will be participating. For more specific information about each route, please visit the Course Maps page. Do I have to follow rules of the road? Yes, all roads are open to car traffic. Please observe all traffic signs and lights. Your safety is important to us and please visit the Safety page under “The Ride: Safety” for a complete description of the rules of the road. Is there a minimum age to ride in CT Challenge? There is no minimum age to ride in the CT Challenge, but riders under the age of 14 must be accompanied by a registered rider adult for the entire ride. All riders must meet their fundraising commitment regardless of age. Can I ride a tandem bicycle in the CT Challenge? Yes, but each Rider on the tandem bicycle must register separately and each Rider must meet his/her own individual fundraising commitment for the route that is chosen. Can I ride with my infant or child? No, under no circumstances may you ride with an infant or child attached to your bicycle or any other riding apparatus at anytime. Can I allow someone else to ride in my place in the CT Challenge? No. Your registration as a Rider in the CT Challenge is never transferable, even if you do not or cannot ride in the CT Challenge for any reason whatsoever, including any illness or injury that may limit or preclude your participation. You are not permitted to grant another person the right to ride in the CT Challenge in your place under any circumstances. What is the difference between registering as an individual, creating a team or joining a team? Create a Team: If you want to be a team captain and haven’t already registered, you can register as a rider and sign up your team at the same time. Join a Team: If you know the name of the team you want to join and haven’t already registered, you can sign up as a team member and register as a rider at the same time. If you want to be a team captain and haven’t already registered, you can register as a rider and sign up your team at the same time. If you have already registered as an an individual rider and decide later to form a team, you can easily do so by contacting us at info@ctchallenge.org. How many people do you need to form a team? A team consists of four or more riders. Teams may share funds by having their team captain contact us at info@ctchallenge.org by October 11th. If a rider has not raised his/her minimum amount by October 18, 2019, the balance of the minimum will automatically be charged to the credit card provided at registration. Can I form a team later, after I’ve registered to ride as an individual? Yes. Contact us at info@ctchallenge.org. If I am a member of a team riding in the CT Challenge, can my team cover my fundraising requirement? 1) A team’s general funds may be shared among individual team riders who still need additional funds to reach their minimum fundraising commitment. 2) An individual team member’s funds in excess of his/her minimum fundraising commitment may be distributed to another team member who still needs additional funds to reach his/her minimum fundraising commitment. *All requests to share funds in either of these scenarios MUST be communicated to CT Challenge at info@ctchallenge.org by the team captain by October 11th, a week prior to the October 18, 2019 fundraising deadline. Can I change the name of my Team? 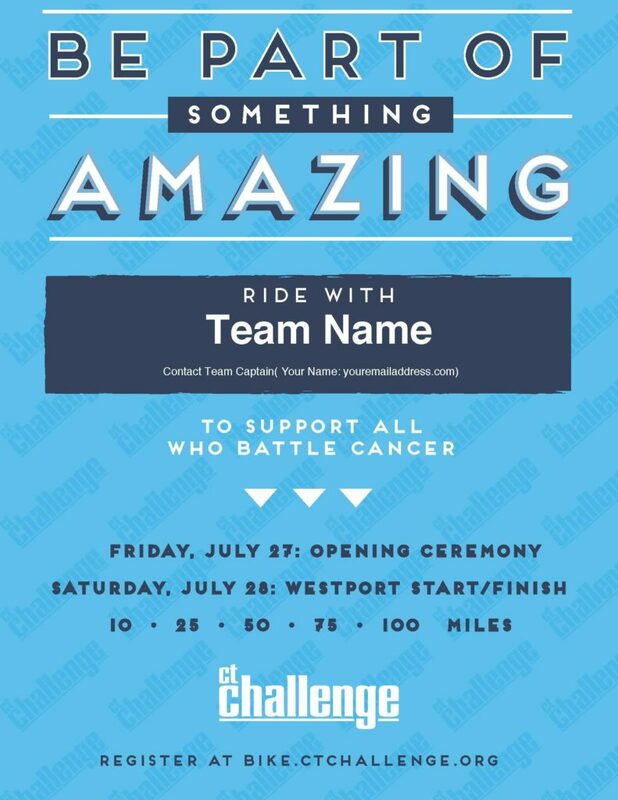 Yes, the Team Captain can change the name of your team by contacting CT Challenge at info@ctchallenge.org. Do Volunteers pay a registration fee? There is no fee to register as a volunteer. Do Volunteers have a minimum fundraising commitment? There is no fundraising requirement for volunteers but we offer volunteers the option to fundraise in support of the mission. Everyone has a personal reason for participating in the CT Challenge – as a volunteer or cyclist. If you communicate your reason to your friends and family and ask them to support a cause that motivates you – helping cancer survivors – you will be pleasantly surprised by how much money you can raise for a great cause. When you register as a volunteer you will automatically get a fundraising webpage that you can customize with your message. You can send a link to your friends and family and ask for their support. If you have questions about how to do this, you can email info@ctchallenge.org. Do I have to register in order to volunteer? Yes, all volunteers must register online. More than 500 volunteers help us run the event. During the registration process you will choose the job(s) you are interested in doing. Can I request to be assigned to work with my friend(s)? The Ride goes on rain or shine. Cyclists will ride in the rain and the weather can change quickly. We need all our volunteers to report for their assigned jobs regardless of the weather. We will have cyclists on the road and we will need our volunteers to ensure their safe, smooth and enjoyable ride. What should I wear when volunteering? Dress casually and comfortably. Late July can be hot and humid so please dress accordingly. Shorts are definitely acceptable. All volunteers will receive a brightly colored volunteer t-shirt when you arrive that must be worn while you are working. What should I bring when volunteering? Volunteers are encouraged to bring sunscreen, water bottles, a small cooler or snacks, especially if you have any special dietary requirements. When and where should I report on the day of the event? With the exception of volunteers who are working at rest stops and in SAG vehicles, all volunteers will report first to Volunteer Check-In at the Hunt Club,174 Long Lots Road, Westport CT 06880. This is where you will check in, receive your t-shirt and any additional instructions you will need to do your job. There is plenty of parking on-site at the Hunt Club. All volunteers should be at their assigned post no less than 15 minutes before their shift is scheduled to start. Can my children accompany me while I volunteer? All Volunteers must be registered and the minimum age for Volunteers is 12 years old. Please refrain from bringing small children with you during your Volunteer Activity. If you would like to have your family join you at the start, rest stop or finish line, we encourage them to come and cheer on Riders but please arrange for another adult to monitor your children during your shift so that you are able to focus on your Volunteer responsibilities. What do I do if my plans change and I can no longer volunteer at the event? Because we assign specific people to specific roles, it is absolutely critical that you notify us as soon as possible if you discover you cannot fulfill your role. We cannot risk having your position go unfilled. Make sure to contact our volunteer coordinator at info@ctchallenge.org so we can find a replacement for you. You must be at least 12 years old to volunteer.